Gov. Bruce Rauner, pictured here at his inauguration in 2015. Gov. 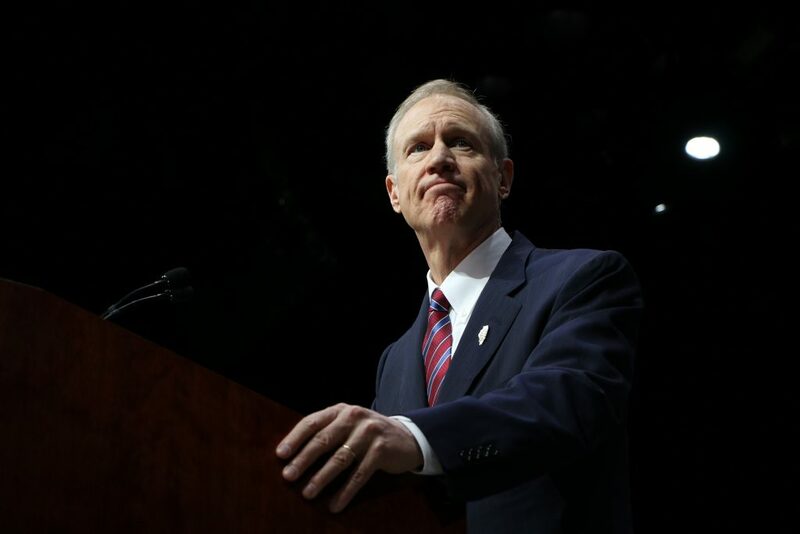 Bruce Rauner last week vetoed a bill which would have raised the statewide minimum wage to $15 per hour. The bill’s sponsors vow an override vote attempt, but it likely lacks enough support to reach the required three-fifths majority. Among other provisions, Senate Bill 81 would have raised the current $8.25 minimum wage in increments over the next few years, ending at $15 per hour by 2022. The bill would have established a different minimum wage for workers under age 18 and would have provided a tax credit for employers to partially offset the increased cost. Rauner vetoed the bill on Aug. 25, pointing to academic research he said showed increases in the minimum wage result in fewer employers providing such work. “This legislation would cost significant sums of money for the very people it purports to help,” Rauner said. The minimum wage concept is deeply divisive, with proponents claiming it ensures workers earn an adequate income and opponents claiming it causes a bevy of unintended economic consequences. The bill originally passed the Illinois House in May with a 61-53 vote and passed the Illinois Senate with a 30-23 vote. The Illinois Constitution requires a three-fifths majority vote to override gubernatorial vetoes, but neither the House nor the Senate passed SB81 with that many votes. In the House, 10 lawmakers would have to change their votes for an override attempt to be successful, and five lawmakers in the Senate would have to change their votes. Rep. Will Guzzardi, a Democrat from Chicago, sponsored the bill in the House. He said in a statement that he hopes to override the veto.